After finishing his first year of college, nineteen year old Michael Turner still does not know what to do with his life. He plays electric guitar and dreams of being in a band. 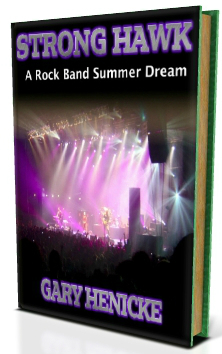 Michael spends a summer with his cousin Keith, the lead guitarist of New Mexico’s most popular rock band Strong Hawk. With the help of Keith and Jake, the talented lead singer of Strong Hawk, Michael develops his guitar playing and a strong ear for music. Michael's world is turned around when they ask him to join the band despite the protests of the spoiled, rich kid drummer. Michael fights through stage fright and gains confidence and a new gorgeous girlfriend. Suddenly, Michael is living a dream of a lifetime performing in the hottest night club in the state. As the band rises in popularity they quickly catch the attention of a record company. Will tragedy destroy Michael's dream and his future? **Recommended for readers age 15 and up. 5 out of 5 star rating. I enjoyed this book. My 16 year old daughter enjoyed it as well. It was well written, and simple to read. I enjoy these when I am short on time but need to relax. The story implies that sometimes the impossible is possible in a fashion that isn't too outlandish. I will look at more from this author. Click a link below to order a copy! Order the paperback on Amazon for $6.49.